Clear Air Force Station ("Clear" colloq.) is a United States Air Force Station radar station for detecting incoming ICBMs and submarine-launched ballistic missiles to NORAD's command center and to provide Space Surveillance data to Air Force Space Command's Space Control Center (SCC). 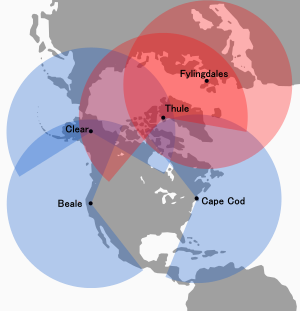 Clear's AN/FPS-123 Upgraded Early Warning Radar is part of the Solid State Phased Array Radar System (SSPARS) which also includes those at Beale AFB, Cape Cod AFS, RAF Fylingdales and Thule Site J. The "historic property" was one of the Alaska World War II Army Airfields and later a Cold War BMEWS site providing NORAD data to Colorado's BMEWS Central Computer and Display Facility (CC&DF). In addition to the "original camp area" with buildings still in use today, areas of the station include the airfield (ICAO: PACL), the "SSPARS Site" the technical site (Utilador, BMEWS reflectors, support buildings, power plant), and the composite site (two permanent dormitories, a mess hall, recreation area, and administrative area). In addition to the Air National Guard unit, Clear has active duty USAF, Royal Canadian Air Force, civilian, and contractor personnel. The site's land with the 1918 Alaska Railroad was purchased by the Department of the Interior in 1949 for Alaskan Air Command's Clear Air Force Auxiliary Field for use as a Ladd Field gunnery range. Total costs for the planned Thule and Clear BMEWS stations in a May 1958 estimate were ~$800 million—an October 13, 1958, plan for both estimated completion in September 1960. An additional 10-by-40-mile (16 km × 64 km) area was appropriated for BMEWS Site II (cf. BMEWS Site I at Thule). Clear Missile Early Warning Station construction began in August 1958 with 700 workers—i.e., a "construction" camp was being erected in September 1958 by "Patti-McDonald and Morrison-Knudsen" next to the railroad (for $1.7 million, 40,000 ft of railroad were moved by 1959.) Groundbreaking for radar structures was May 1959 ("Baker and Ford built a transmitter and computer building; a heat dissipation system; a radar transmitter building; wells and pumphouses; a fire station; and utilities") and the AN/FPS-50 pedestals were complete by June 2, 1959. In 1959 after the original White Alice Communications System contract, "the next segment of WACS... was series of TD-2 microwave installations to support... two routes [that] linked the Ballistic Missile Early Warning Site (BMEWS) at Clear AFB... one going down the southeast coast (the A route) to the Ketchikan-Seattle submarine cable*, and the other, going east to the Canada–US border (B Route) through Canada, down to the lower 48" which was Clear's Rearward Communications System to Murphy Dome (A Route) and the Gold King Creek AFS (B Route) with data for the Ent AFB CC&DF. ^ compiled by Johnson, Mildred W (31 December 1980) [Feb 1973 original by Cornett, Lloyd H. Jr]. A Handbook of Aerospace Defense Organization 1946 - 1980 (PDF). Peterson AFB: Office of History, Aerospace Defense Center. Retrieved 2012-03-26. ^ a b c "Watchful eye of BMEWS turns toward Soviets" (Google news archive). Ellensburg Daily Record. June 18, 1961. Retrieved 2014-03-09. ^ "Clear AFS". GlobalSecurity.org. 2005-04-27. Retrieved 2009-11-04. ^ a b Cold War Historic Properties of the 21st Space Wing Air Force Space Command (PDF) (Report). OSTI.gov. Retrieved 2008-11-04. ^ Cultural Resources Survey and Management Plan of the Clear Air Force Station (PDF) (Report). ORNL.gov. 1991. Retrieved 2008-11-04. ^ a b Wainstein, L. (June 1975). The Evolution of U.S. Strategic Command and Control and Warning: Part One (1945-1953) (PDF) (Report). Study S-467. Institute for Defense Analyses. pp. 1–138. Retrieved 2014-03-09. ^ page 269 "William A. Smith Contracting relocated a 40,000-foot length of the railroad." 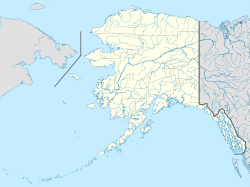 ^ a b c "Rearward Communications... One route roughly paralleled the Alaska Highway; the other ran south along the Gulf of Alaska to Annette Island, and relayed data from there to Seattle by submarine cable. The Alaska District awarded 28 contracts totaling over $18 million for the 32 stations. By 1961, all site work had been completed.68"
^ Rogers, Warren Jr. (June 2, 1960). "Summit Failure Speeds Up Development of BMEWS". Herald Tribune News Service. Retrieved 2014-03-09. ^ Installation Restoration Program Preliminary Assessment: Gold King Creek Radio Relay Station, Alaska (PDF) (Report). Hazardous Materials Technical Center. April 1989. Retrieved 2014-04-14. The RRS originally consisted of one radio relay building, one microwave tower enclosed by a chain link fence, and a 2,050-foot runway. These facilities total 30.32 acres. Two 14,000-gallon steel underground diesel fuel storage tanks are located west of the building. Figure 3 shows the original facilities at Gold King Creek RRS. ^ McManus, Gene (September 1996). "BMEWS - 51- Full Days". Retrieved 2014-03-19. ^ Del Papa, Dr. E. Michael; Warner, Mary P (October 1987). A Historical Chronology of the Electronic Systems Division 1947-1986 (PDF) (Report). Retrieved 2014-03-08. 7 November  Installation of [SSPARS] radar hardware at Site I, Thule, Greenland, for the Ballistic Missile Early Warning System (BMEWS) was begun. ^ "The Morning Record - Google News Archive Search". ^ a b "[6.0] Miscellaneous Topics". ^ "Clear Air Force Station, Alaska". ^ Grimes, M. D.; Grothaus, M. G.; North, W. R.; Brittain, D.; Norander, R.; Kajonpong, D. (1 July 1995). "A new modulator design for the BMEWS transmitter". pp. 688–693 vol.1. 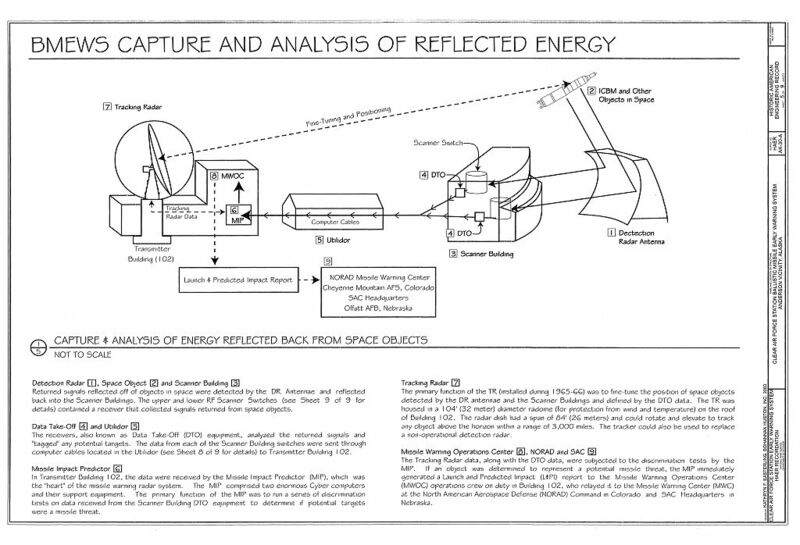 doi:10.1109/PPC.1995.596791 – via IEEE Xplore. ^ a b Pike, John. "Clear AFS". ^ Skolnik, Merrill I (1990). Radar Handbook (PDF) (2nd ed.). McGraw-Hill. ISBN 978-0-07-057913-2. Retrieved 2014-04-14. ^ "Clear AFS, AK". GlobalSecurity.org. Retrieved 2014-03-05. ^ "BAE Systems To Continue Maintaining SSPARS Radar Network for U.S. Air Force - SpaceNews.com". 3 March 2014. ^ "U.S. to Sell Large Early Warning Radar to Qatar (August 7, 2013) (corrected February 10, 2014)". 7 August 2013. ^ "Fylingdales". Raytheon.co.uk. Archived from the original on 2014-03-11. Retrieved 2014-03-08.